EPRUI supplies red polystyrene fluorescent microspheres with high fluorescence intensity, stable performance and narrow particle size distribution. 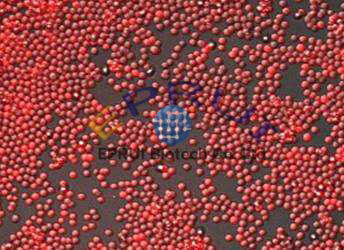 Colored polystyrene microspheres are also available. Our red fluorescent microspheres can be used for a wide range of applications including medical diagnosis, blood flow determination, tracing, in vivo imaging, calibration of imaging and flow cytometry instruments. Our dyes are incorporated throughout the bead and not just on the surface, so they are relatively immune to photobleaching and other environmental factors. Dyes leak will not happen even after high-speed centrifugation. Carboxylated microbeads have a high density of homogeneous distribution of carboxylic acids on the surface, which makes carbodiimide (EDAC) and other water-soluble imine reagents covalently coupled protein and other amino-containing biomolecules easy to pass. Dye molecules are incorporated throughout the bead making fluorescent signals more stable. 10% of dye concentration making sure high fluorescence intensity and brightness. Highly uniform particle size (CV<5%).Small batch difference and good repeatability. Customization of different functional groups and particle size (20nm-100um) is accepted.